Dill is an annual plant; the hollow, finely grooved green stem grows 1-3 feet high and is striped dark green and white with bluish spots. The leaves are bluish-green, bipinnate with filiform leaflets; the base dilates into a sheath surrounding the stem. 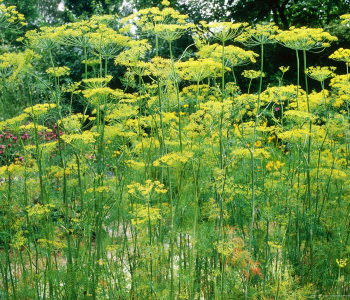 Flat, compound umbels of yellow flowers appear in clusters from July to September, producing eventually the oval, ribbed dill seeds. Goes to seed quickly and the seeds are attached to the umbel tips in pairs. Dill roots are not usable for medicine or cooking. Visibly resembles fennel and must be correctly identified before use. While fennel commonly shows many stems from a single root, dill develops one main stem. Newer varieties are shorter. Widely cultivated as a spice but also found growing wild in North and South America and in Europe, South Africa and East Africa, Asia, and the Mediterranean. Native to southwestern Asia and the Mediterranean. The common name dill probably comes from the Saxon word dillan, meaning “to dull”, referring to the practice of giving dill to restless babies to make them sleep. Dill was supposed to be effective against witches in the Middle Ages. Dill has been known to us for several thousand years. The Egyptians prized it as highly as did the Greeks and Romans, principally as a culinary herb, but one of medicinal benefit also. Some say dill is a native of the Orient. Roman war heroes were crowned with garlands of dill as they returned to their city in victory. Romans fed it to gladiators to ease digestion. In colonial times dill was called “meeting seed” for the colonial dames took it to church and ate it during the long sermons in order to keep awake. In the 18th century it was given to babies to lull them to sleep, and to small children to keep them awake in church. Used in some of the earliest gardens in America for flavoring and pickling. Dill tea, made with water or white wine, is a popular remedy for upset stomach and dyspepsia. Dill helps stimulate appetite, gastralgia, gas, helps stop hiccoughs, colic, and a decoction of the seed may be helpful for insomnia due to indigestion, as well as for pains due to flatulence, useful in swellings and pains, quieting to nerves. Nursing mothers can use dill to promote the flow of milk, particularly in combination with anise, coriander, fennel, and caraway. Try chewing the seeds to clear up halitosis. Considered helpful for low-salt diets. Soaking in dill water is said to help strengthen fingernails. Infusion: steep 1 tsp. dill seeds in 1 cup boiling water for 10-15 minutes. Strain. Take 1/2 cup 2-3 times daily. Dill is similar to the carrot family, which includes a host of poisonous species that may be mistaken for this medicinal plant.